The origins of adipocytes have been hotly debated, but a human study supports the idea that the bone marrow takes part. WIKIMEDIA, OPENSTAX COLLEGEThe origins of new fat cells (adipocytes), which we humans must make throughout our lives, have not been clear. 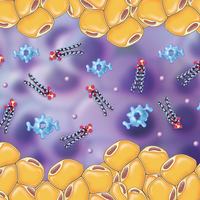 Rodent studies have produced conflicting results on where adipocyte progenitors come from, particularly with regard to the bone marrow as a possible source. 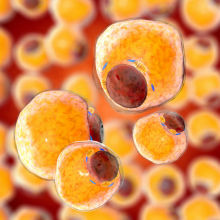 Reporting today (July 16) in Cell Metabolism, researchers have found that, in patients who received bone marrow transplants, donor cells contribute to new fat tissue, and that the proportion of these bone marrow-derived adipocytes is higher in obese patients. 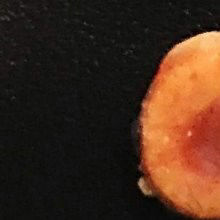 “In these bone marrow-transplanted individuals, they can actually find fat cells with genomic information from the donor and not from the recipient,” said Philipp Scherer, director of the Touchstone Diabetes Center at the University of Texas Southwestern Medical Center in Dallas who was not involved in the study. Although the contribution of bone marrow cells to the abdominal fat is low—about 5 percent, on average, with a range up to 27 percent—it’s “conceptually important that we can actually demonstrate that the bone marrow in the adult individual contributes to new fat-cell generation,” Scherer told The Scientist. Fat cells do not divide; instead, they live about 10 years and are then replaced, according to a 2008 Nature paper by Peter Arner of the Karolinska Institute in Stockholm, Sweden. Arner and his colleagues, including researchers at Stockholm’s Royal Institute of Technology and at the University of Lyon in France, wanted to know where these cells come from when they are replaced. The accepted view was that adipocytes came from progenitors near blood vessels in the white adipose tissue, but it was unclear whether or not bone marrow cells also contributed to adipogenesis. “There have been some mouse studies which suggest this is true and that it happens, and there have been other studies that look to be pretty well performed that show that this is not true. It’s been a controversial area, to say the least,” said Evan Rosen, who studies adipocytes at Beth Israel Deaconess Medical Center in Boston and was not involved in the study. To try to determine whether bone marrow cells can form adipocytes in humans, Arner’s group took advantage of a sort of natural experiment: patients who had undergone bone marrow transplants to treat blood diseases. (Some patients instead received transplants of peripheral blood stem cells, which are derived from the bone marrow but collected from the blood.) Before a transplant, the patient’s own bone marrow is destroyed so that afterward, any bone marrow-derived cells come from the donor tissue and, conveniently for this research, are genetically distinct from the patient’s. The researchers biopsied abdominal fat from 65 transplant patients, who had received transplants three to 31 years ago, and, using genetic markers, determined the percentage of adipocytes that were donor-derived. They found that the percentage of donor-derived adipocytes in the tissue increased linearly in the years post-transplantation, as adipocytes died and were replaced by new fat cells, some proportion of which evidently came from the bone marrow. The researchers found evidence that the bone marrow-derived fat cells came both from cell fusion of a bone marrow cell and an existing adipocyte and from differentiation of progenitors. To figure this out, they used laser capture microdissection to isolate individual fat cells, then sequenced their DNA and looked for donor- or recipient-specific genetic differences. 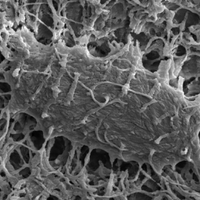 This was “very, very difficult” technically, said first author Mikael Rydén, because the adipocytes float in suspension, rather than sticking to the bottom of the tissue culture dish, as other cells do. In order to get around this, the researchers embedded the floating fat cells in agarose before using a laser to cut out individual cells under the microscope. They did this technique for a few cells—around 30 per patient—in three patients. Of those, some were completely donor-derived, indicating that these cells came from the donor bone marrow. “For us, at least, at this stage, with the techniques we have at hand today, that’s the ultimate proof that donor-derived cells can become adipocytes,” Rydén said. To understand how much these bone marrow-derived cells contribute to new tissue, study coauthor Samuel Bernard, a bioinformatician at the University of Lyon, created a mathematical model based on the data. In this model, the percentage of donor-derived adipocytes increases until it reaches what researchers call a steady state: the point at which the number of donor-derived cells being added to the adipose tissue is the same as the number being replaced. 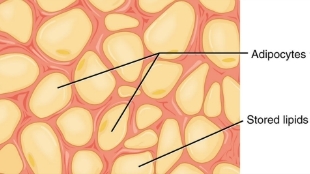 According to the model, at this point, the bone marrow contributes about 10 percent of total adipocytes, on average. Obese patients, however, have twice as many adipocytes as lean patients, according to the 2008 study. Based on the new mathematical model, the fraction of adipocytes derived from the bone marrow increases as body mass index goes up. Bone marrow-derived cells in extremely obese individuals contribute 2.5 times as much to subcutaneous adipose tissues as those from lean individuals. M. Rydén, et al., “Transplanted bone marrow-derived cells contribute to human adipogenesis,” Cell Metabolism, doi:10.1016/j.cmet.2015.06.011, 2015.